BUY THE SET AND SAVE $6.20! The following are a series of books that were copied from 12 radio programs that were written and produced by E. Raymond Capt. 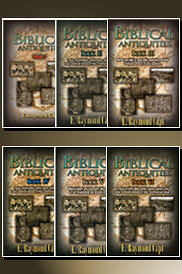 They are ideal for Bible study groups or individuals. 3. Have Sodom and Gomorrah Been Found? 12. Resurrection of Christ - A Hoax? 10. Who are the Scythians? 12. Joseph of Arimathea - Nobilus Decurio.